In this issue: Meta-heroes, clockwork assassins, and interplanetary airships—plus a chance to win a Liaden Universe® signed poster in our January contest. Meta-Heroes fight for a sometimes ungrateful humanity in a world one step away from our own. Fire-bender John Murdock, hacker-witch Vickie Nagy, healer Belladona Blue, super-quick Mercurye rely upon their ghostly ally, Seraphym, the spirit of the world. 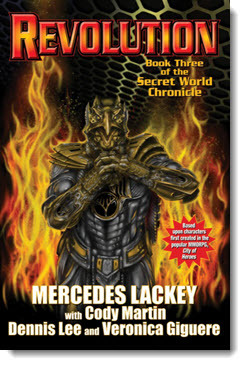 Financier villain Verdegris knows he must trap and destroy her if he is to take down the metas. Here’s the third entry in the Secret World Chronicle. 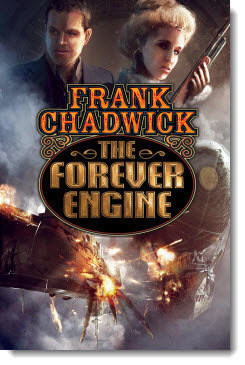 Airships, Clockwork Assassins—and a Universe to Save! London 1888. His Majesty’s airships troll the sky powered by antigrav liftwood as a cabal of Iron Lords tightens it hold on a Britain choked by the fumes of industry. And somewhere far to the east, the Old Man of the Mountains plots the end of the world with his Forever Engine. Enter Jack Fargo, former special forces operator in Afghanistan. Fargo is a man on a mission: save the future from destruction when the Forever Engine is brought to full power and blows the timeline to smithereens. The Ring of Fire Saga Continues! Another thrilling entry in the best-selling Ring of Fire series, created by Eric Flint. By 1636, the time traveling impact of an American town thrown back to the 17th century stretches across two great oceans. Daring pioneers cross the Atlantic and found a new colony on the Wild Coast of South America, determined to avoid a slave economy by using up-time knowledge. In Japan, new technology breaks centuries of isolation and a nation emerges into an enlightened era two centuries early, but not without upheaval and conflict. 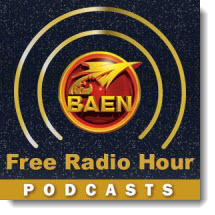 Resolve to spend 2014 with your favorite Baen authors on The Baen Free Radio Hour. In-depth interviews with David Weber, Lois Bujold, Eric Flint, Larry Correia, Sharon Lee and Steve Miller, David Drake, and much, much more. Win a Signed Trade Secret Poster! We're ringing in the New Year with a contest to bring good cheer to all. Simply send us an email and you'll be entered into a random drawing to win a poster-size blow-up of the cover for Liaden Universe® novel Trade Secret, signed in indelible marker by Sharon Lee and Steve Miller. If you’re talking about the title of an upcoming book—a lot! John Joseph Adams, editor of a new anthology of military fantasy stories for Baen Books, wants help finding the perfect title. Head on over to his blog for details, including info on some most excellent prizes you might win for helping out! Meta-Heroes fight for a sometimes ungrateful humanity in a world one step away from our own. Fire-bender John Murdock, hacker-witch Vickie Nagy, healer Belladona Blue, super-quick Mercurye rely upon their ghostly ally, Seraphym, the spirit of the world. 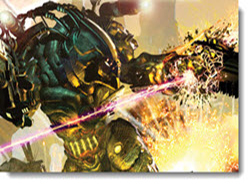 Financier villain Verdegris knows he must trap and destroy her if he is to take down the metas. 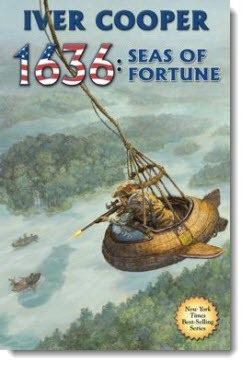 By 1636, the time traveling impact of an American town thrown back in time stretches across two great oceans. Daring pioneers cross the Atlantic and found a new colony on the Wild Coast of South America, determined to avoid a slave economy using up-time knowledge. In Japan, new technology breaks centuries of isolation. London 1888. His Majesty’s airships troll the sky powered by antigrav liftwood, as clockwork assassins stalk the European corridors of power. And somewhere far to the east, the Old Man of the Mountains plots the end of the world with his Forever Engine. Enter Jack Fargo, former special forces operator in Afghanistan. A man from our own near future thrust back in time. Fargo’s mission: save the future from destruction when the Forever Engine is brought to full power. 15 short tales of the Liaden Universe® brought together for the first time in this, the second of two mega-volumes. Here are tales of the vast tapestry of tales of the scouts, artists, traders, priestesses, sleight of hand magicians, and pilots who fill the Liaden Universe® with the excitement, action, and romance that readers of the hit series have come to adore. The Iron Cage: When a star ship arrives, Johnny must choose between the bear-like People who raised him and his lost heritage. Breed to Come: On a distant future Earth, humans return and the catlike People are in no mood to deal with those who abandoned them so long ago. Contains two outstanding novels in Andre Norton’s legendary People saga. 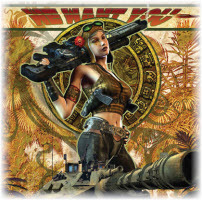 Don't forget to check out the newest ebook releases here, plus Baen.com free fiction from Frank Chadwick here. Also, don’t miss the monthly free non-fiction, article, “The Exoplanet Hunters” here, and part three of a series by Tom Kratman,“Training for War,” here.